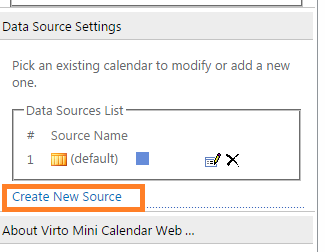 To add new data source to the Mini Calendar, use “Create New Source” link. 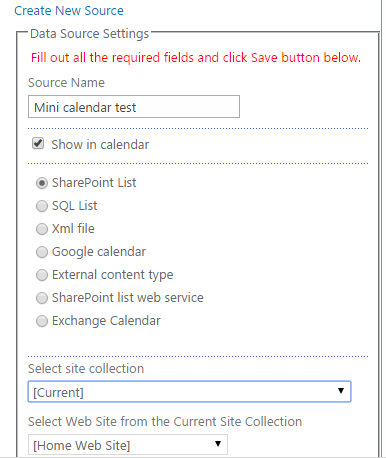 Select “SharePoint List” in the list of data source types. Type the name of new data source and check the box “Show in Calendar” to make it visible in the calendar. Select the required web-site in the dropdown. You can also select site collection from the current farm, just select required one. Then select the required list with data. 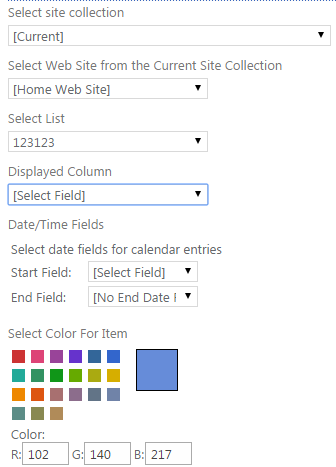 Define date fields for Mini Calendar entries (start time and end time columns). Select the color which will be used events of new data source. Now click “Save” to create the data source. It will be displayed in the list of data sources. Then click “OK” to finish adjustment or click “Apply” to save the settings and continue.